This is one of those recipes where you think…Do these things really go together? I came up with this recipe by accident. I had bought an assortment of ingredients to use in other dishes, malady but things got hectic and I never got around to them. Not to be wasteful, I sauteed some chorizo with garlic, added shrimp and some ribbons of radicchio. Then I tasted. Not bad. Pretty good actually. But what should accompany my shrimp and chorizo? Of course pasta was the first thing that came to mind, but I’ve been posting so many pasta recipes lately, I thought I’d give y’all a break. Only other thing I had on hand were some just ripe plantains. The sweetness was a perfect contrast to the slightly bitter radicchio. Think about Texture. You want some kind of contrast between soft and firm. Nothing too mushy or too tough. In this recipe, the plantains are soft, the chorizo is a little tough and the shrimp add an almost-crunch. Another traditional combination? Steak and mashed potatoes. Color. You want as much color as possible on your plate. Not only will it be prettier, it will also be more nutritious. Contrast is key – no one likes an all-brown plate of food. Taste constantly. Taste your meal while your cooking it (make sure all meat is cooked!) so you can adjust the salt and flavoring as you go. Not spicy enough? Add red pepper flakes. Too bitter? Try some honey. Add flavor in small doses. You can always add more, but it’s hard to take it out. Flavor. Balance your flavors. Think of salty, sweet, bitter, spicy and acidic. Pay the most attention to your food’s acidity. Most people will think a dish needs salt, but usually some citus zest or juice or a dash of vinegar will make all the other flavors pop. Cooking should be fun. Play around in the kitchen and experiment by changing up a favorite recipe or coming up with your own from scratch. Sometimes, it won’t work out, but don’t be discouraged. Order pizza and try again tomorrow. Preheat the oven to 400 ° and line a cookie sheet with foil. Grease the cookie sheet and place the plantain halves on them. Bake for 15 minutes, or until tender throughout. While the plantains cook, heat a large skillet over medium-high. When it’s hot, add the oil and heat it, then add the garlic and chorizo. Saute for 2 – 3 minutes, or until the garlic is fragrant and the chorizo fat renders a bit. Add the shrimp and radicchio and saute for another 6 – 8 minutes, or until the shrimp turn opaque. Remove from heat. 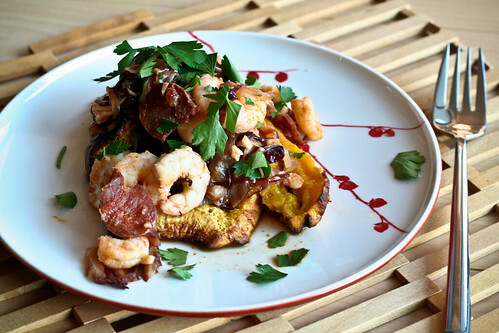 Place 2 plantain halves on a plate and top with shrimp and chorizo. Sprinkle with parsley and serve immediately. this looks wonderful, and the flavor and texture combinations are tempting… bookmarked!